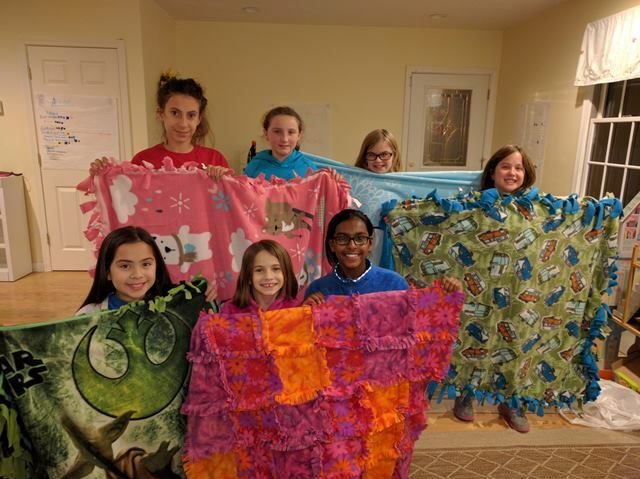 Northborough – Northborough Girl Scouts Troop 11594 has a goal to collect 235 handmade, no-sew blankets by the end of February to donate to Project Linus as part of their Bronze Award project. The mission of Project Linus is to provide handmade blankets to children who are seriously ill, traumatized or otherwise in need of the extra comfort, warmth and security a blanket can give. It is recommended that the blankets be fragrance free, as any strong odors from detergents or smoke may cause problems for some of the kids. As part of the Bronze Award process, Scouts are required to initiate a project plan, put the plan in motion, and manage it to meet their goal successfully. They are encouraged to work a minimum of 20 hours on the project. The blankets will be donated to the pediatric wing at UMass Medical in Worcester. The fifth-grade girls attend Fannie E. Proctor School and Marion E. Zeh School. The troop is led by leaders Sherry Clark, Anne Marie Farricy and Anne Marie Rajguru. Clark noted that no-sew blanket kits are easily purchased at craft stores such as JoAnn’s Fabric and often are on sale. The troop will also accept kits that are not completed if people would like to donate but do not have the time to actually make the blanket. “It’s a great project to do with your family, school class or community group,” she said. . The blanket donation is only one phase of the girls’ project. The troop is working on multiple things to benefit the pediatric unit of the hospital. They will also be organizing arts and crafts bags that will contain everything a hospitalized child will need to complete a project in bed. In addition, a collection of new games will be held later in the year to ensure that the hospital’s common room has a variety of games to entertain the kids during their hospital stay. Blanket donations are being accepted at Proctor School, 26 Jefferson St., and Zeh School, 33 Howard St., and blanket pickup can also be arranged by calling 508-254-2217. Additional information on Project Linus can be found at www.projectlinus.org.